What sort of Wednesday Word is that, I hear you ask. Surely everyone knows what the Word of God is – the Bible is the Word of God! Yet, ‘in the beginning was the Word, and the Word was with God and the Word was God’ (John 1:1). And when Paul and Barnabas were on their first missionary journey, newly saved Gentiles ‘glorified the word of the Lord’ (Acts 13:48). The Word ‘grew mightily and prevailed’ (Acts 19:20). And the Word of the Lord gets preached and spoken a lot in the Bible too. Sometimes people even do things ‘by the Word of the Lord’ (e.g. 1 Kings 13:1) without that particular Word of the Lord being written down in the Word of the Lord! Confused yet? Lest you think I’m just trying to confuse you today, here’s something that will hopefully help – the concept of the threefold Word. Basically the idea of the threefold Word is that the Bible, Jesus and proclamation are distinct yet inseparable. The Bible is a book about Jesus which is to be proclaimed. 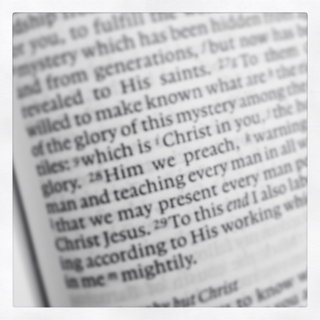 Jesus is the subject of Scripture and the content of true proclamation. Proclamation, if is to be true Christian proclamation, is proclaiming Christ biblically. The three go together.